3 . In a bowl beat the eggs, add Parmesan cheese and a pinch of pepper. Mix and add the asparagus. Heat a tablespoon of olive oil in a non-stick pan. Cook over medium heat, turning the frittata (omelette) once. 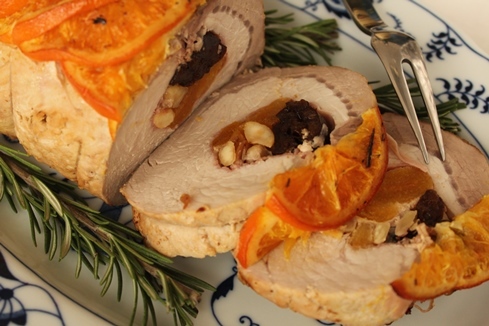 This recipe is simple, but it teases your palate with its rich flavor. Chicken with peppers, better known as chicken of ” Sora Lella ,” is a tasty main course (watch this interesting video https://www.youtube.com/watch?v=YMRY2DFWBos). It takes its name from the renowned sister of the famous Italian actor Aldo Fabrizi (1905-1990). 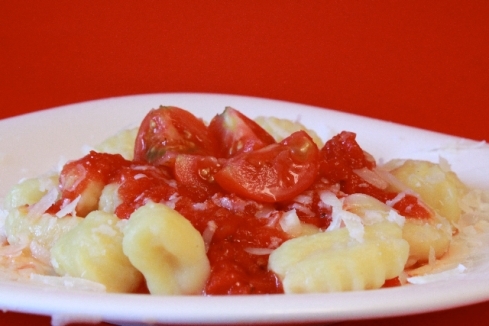 She used to prepare this recipe in her trattoria in Rome. 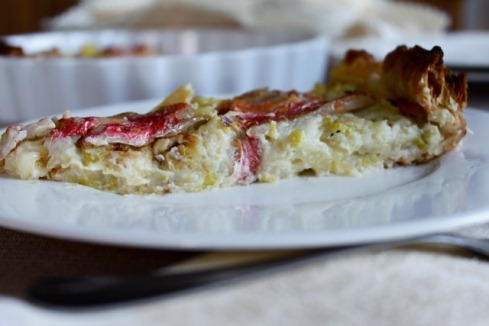 It’s a tasty Roman dish that you can enjoy with mashed potatoes, polenta or basmati rice. 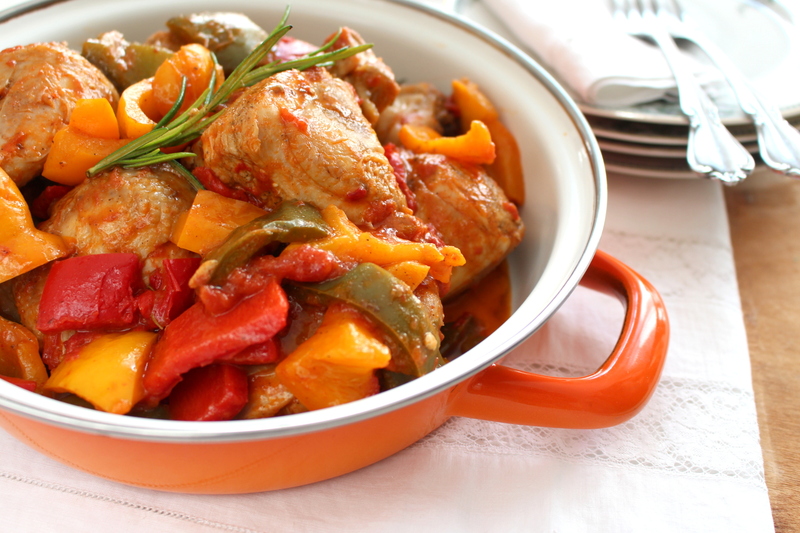 The combination of peppers and the delicate chicken meat creates a truly inviting dish. The addition of chilli pepper gives a special bite to this recipe. The amount of chili is purely personal, if you want a really spicy dish you can add two chilli peppers. The chilli pepper adds flavor, and it is beneficial to your health (see also spaghetti alla puttanesca). You should not forget that it increases your metabolism and is therefore a good ally to help you lose weight! Like many recipes, this one has a lot of variations. You can either add onions to the chicken or omit the tomatoes. The recipe that I am presenting is the one I like the most. Peppers are very versatile vegetables, I enjoy them prepared in different ways. I would also suggest trying grilled peppers, a tasty appetizer or side dish . 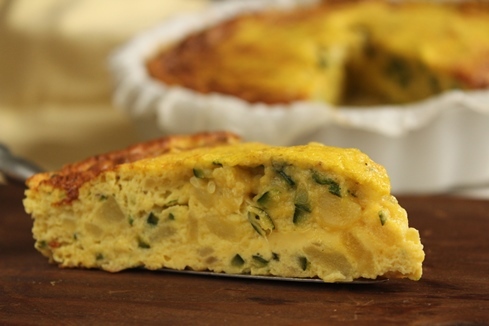 An appetizing pie made ​​with potatoes, shallots and hard-boiled egg yolk to get a colorful, mimosa-like colorful effect. A different idea to celebrate Women’s Day on March 8th. This recipe is a simple, versatile and absolutely delicious one to enjoy either as an appetizer or as a main course accompanied by a fresh salad. The delicate but distinct flavor of shallots blends well with the starchy taste of potatoes. The addition of cream makes this pie velvety and inviting. 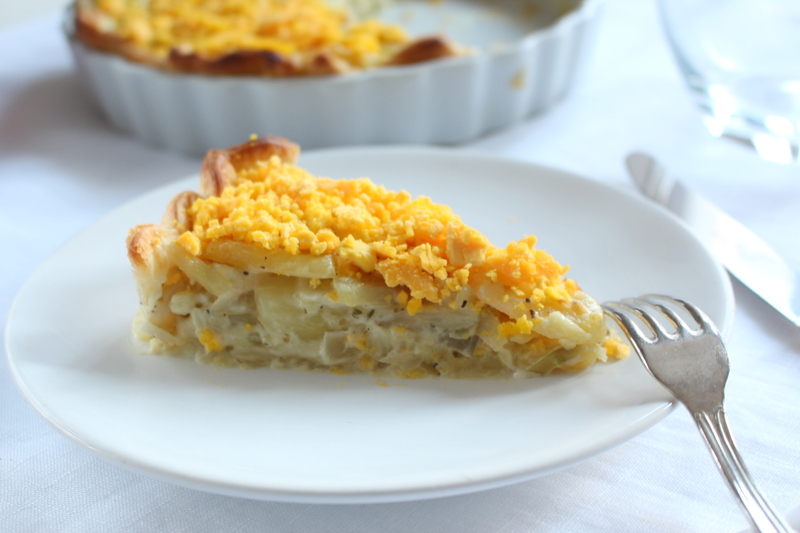 The crumbled egg yolk is an additional decoration to create the mimosa effect and makes this pie perfect to celebrate Women’s social, economic ,and political achievements. This holiday was first celebrated in the United States in 1909 and arrived in Italy in 1922. The mimosa flower, with its intense and radiant color, was chosen as a symbol because it blooms in early March. The addition of boiled egg yolk is not essential and can be omitted, but this pie makes a savory version of the famous mimosa cake dessert. Cutlet is one of most typical dishes from Milan, sharing the stage with Milanese risotto and “panettone”. 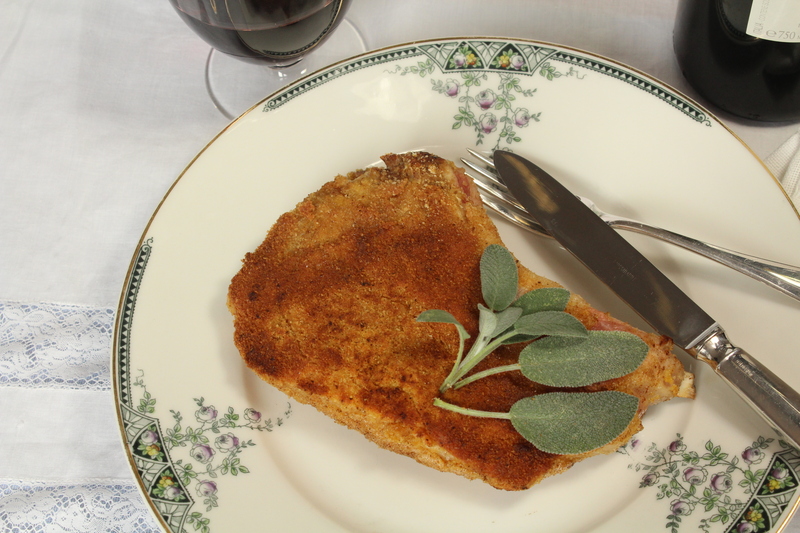 It is a veal cutlet, coated with egg, covered with bread crumbs and then fried in butter with sage. The sage gives a special aroma to the meat, a real delight! There are two variations of cutlet: one thicker, the meat is more tender and a thinner one, in which the crunchy breading is more prominent. The latter version is sometimes called elephant ear, because of its shape. It should not be mistaken for Weiner Schnitzel from Vienna. The Milanese cutlet includes the bone, whereas Viennese does not. In addition, the Milanese is dredged only in bread crumbs, instead the Viennese both in flour and bread crumbs and then fried in lard. As you will often find in these cases, there is a debate about where this dish comes from. So far there is no definitive answer, but being Italian, I should say that it is Italian … and we are proud of it! 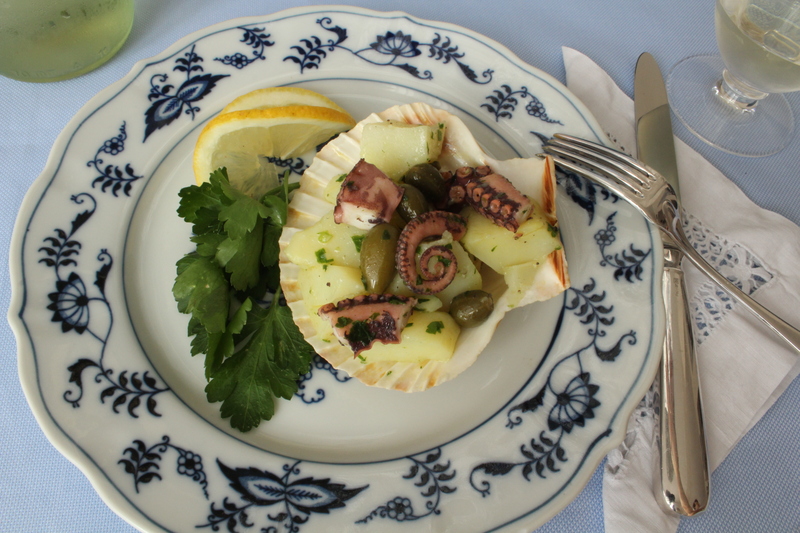 It can be served as a main dish served with potatoes or a salad. It is something that I often prepare for a family dinner. My kids love it, especially when I serve it with homemade potato croquettes. This summer I was cooking for some American tourists staying on Lake Como and one asked me to cook rabbit, so I thought it may be a good addition to the blog.The, coniglio alla ligure, Ligurian rabbit, is an appetizing second course from region of Italy’s Riviera; in fact, for a long time this region was home to many rabbit farms. Nowadays this delicious recipe is enjoyed throughout the entire country. It makes a perfect dinner for family and friends. I recommend roasted potatoes as side dish or if, you prefer something lighter, steamed potatoes . 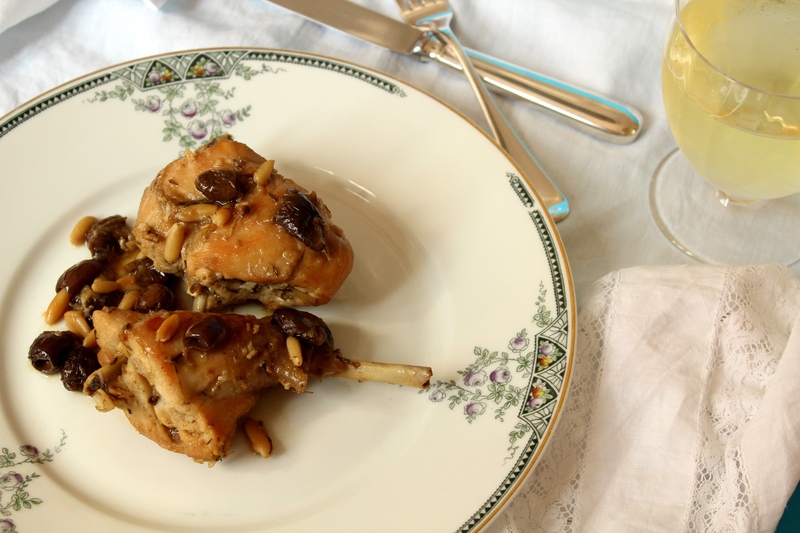 The delicacy of this dish is due to the mixture of the mild taste of rabbit flesh, the sweet and fruity flavor of the Ligurian olives and the gentle taste of pine nuts. Rabbit meat is rich in protein but also low in cholesterol, so it is particularly suited for low-calorie and low-fat diets. I prefer stewing instead roasting rabbit; since it’s lean meat, you need to use extra fat to keep it from drying out when roasted. In this recipe I cook the dish until the liquid is reduced to a thick coating, not at all soupy. Did you know that the rabbit is native to Africa ? It was later imported to Europe, especially to Italy and France. The Italian name coniglio derives from the Latin word cuniculus, referring to the ability of this animal to dig warrens with many tunnels (cunicoli). 3. Deglaze with white wine and add olives, pine nuts and a ladle of broth. Cover with a lid and cook on medium-low heat for about an hour until flesh is tender (it will separate easily from the bone). Moisten occasionally with a ladle of broth. Serve warm ! Every season has a flavor all its own. Spring should arrive soon with its delicious vegetables, and asparagus is one them. Actually it is available year-round, but Spring is the best season to enjoy fresh asparagus. Asparagus comes in different colors and varieties: green, white, violet or purple, wild. These varieties are interchangeable in recipes; the major difference is the color of the final dish. 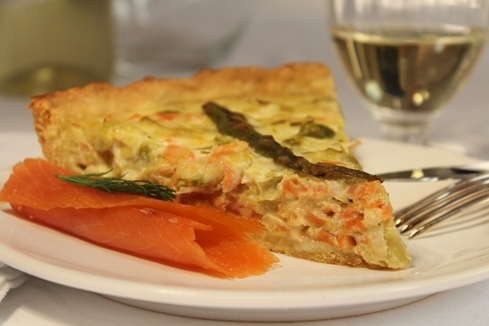 This pie is an elegant, impressive, colorful (don’t forget that we enjoy food first with our eyes) and flavorful dish made with fresh asparagus (violet-purple variety, typical of Italy), leeks and smoked salmon. It is a delectable dish to serve as a starter or enjoy as a main course accompanied by a salad. The mild onion-flavor of the leeks blends well with the distinct taste of asparagus and the tangy, intensive texture of smoked salmon. Asparagus has been considered a delicacy since ancient times (3000 BC), being used both as a vegetable and a medicine (diuretic). It is low in calories, and it is a good source of vitamins (B1,B6, A, C), minerals (zinc, potassium, phosphorus and magnesium) and dietary fibers. It is one of my preferred Spring vegetables; I can eat it with just about anything! In fact, it is a versatile vegetable which can be prepared in a number of ways as an appetizer, vegetable side dish, main dish accompanied by eggs, fish or first course with pasta, risotto and soups. Let’s enjoy asparagus for the next few months! 4. Wrap in plastic and refrigerate for at least 30 minutes. 5. Flatten the chilled dough on a lightly floured board, then transfer to a 30 cm (12 in) ceramic or glass pie or tart baking dish. Gently pat the pastry dough in the pan to 4 mm (less than ¼ in) thickness, to line the bottom and sides. The edge should have a slightly thicker layer of pastry than the bottom, about 5 mm. 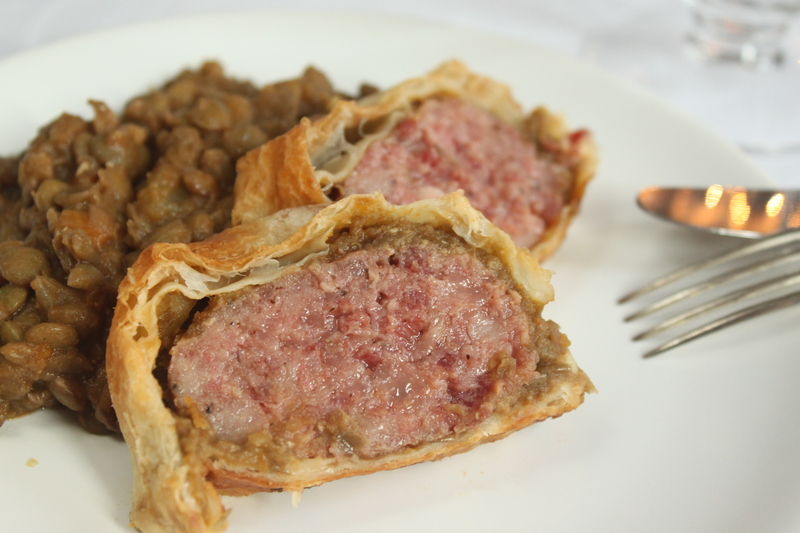 This is a simple, versatile and absolutely delectable recipe. It is a tasty dish to serve as a starter or enjoy as a main course accompanied by a salad. The distinct but mild onion- flavor of the leeks blends well with the starchy potatoes and the delicate texture of the red mullet, a light-pink fish found mainly in the Mediterranean sea. Leeks were used in Egyptian cuisine as early as from the second millennium BC, both as vegetables and as aromatic herbs. In Roman times Emperor Nero loved leeks in his soups believing that they improved the resonance of his voice. Nowadays we still enjoy leeks in our soups, risotto, pasta, frittata (omelets), or just raw and finely sliced in salad vinaigrettes. Leeks are often used to flavor dishes such as fish, pork and lamb. For example, you can use them as “ natural container” to wrap up food (especially fish) during cooking, to give it an enhanced flavor. Leeks can be served as delicious vegetable side dish, boiled and then baked with butter and cheese, or simply seasoned with oil and lemon. In addition, leeks are a nutritious and healthy vegetable, rich in water (over 90%), in vitamin A and C, as well as containing moderate amounts of B vitamins and few calories. We should not underestimate the aphrodisiac aspect of the leeks, a commonly known since ancient times. 8. Remove from the oven and allow to sit for about 10-15 minutes before serving. In past centuries, peasants used the vegetables cultivated in their fields and the animals raised on their farms to prepare their meals. 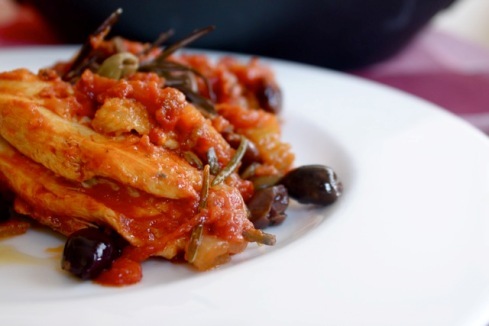 Pollo alla cacciatora is one of these peasant recipes and seems to have originated in Tuscany. 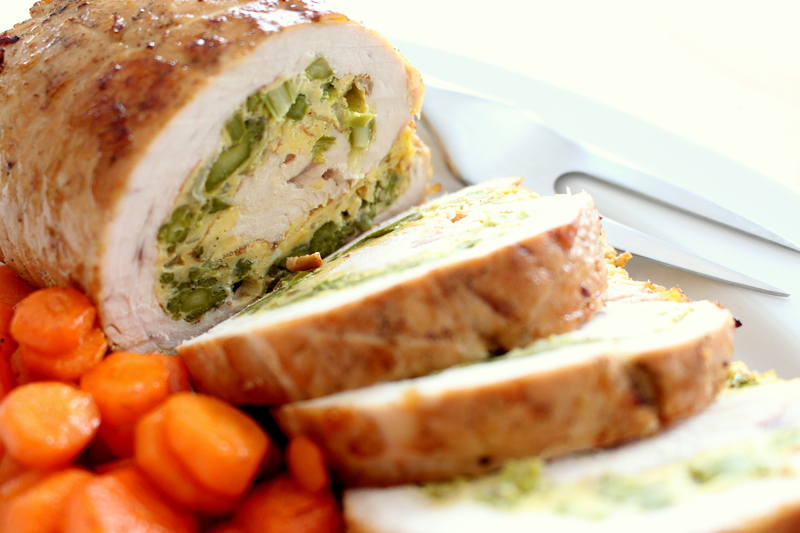 Typically for Sunday dinner, chicken, a readily-available animal, was used to prepare a fine and festive feast. The addition of fresh vegetables such as garlic, carrots, onion, celery, rosemary, tomatoes – as well as a good dose of wine – enhanced the flavor of the meat. The name pollo alla cacciatora makes reference to the ingredients like garlic and rosemary, used by hunters (cacciatori) when cooking game. Today we enjoy this delectable dish throughout the peninsula as a second course or else as main course accompanied by either mashed potatoes or polenta (for the polenta recipe, see Brasato con polenta). I like this recipe because it is so versatile, and there are many adaptations of the classic recipe (please refer to the notes below for some suggestions). 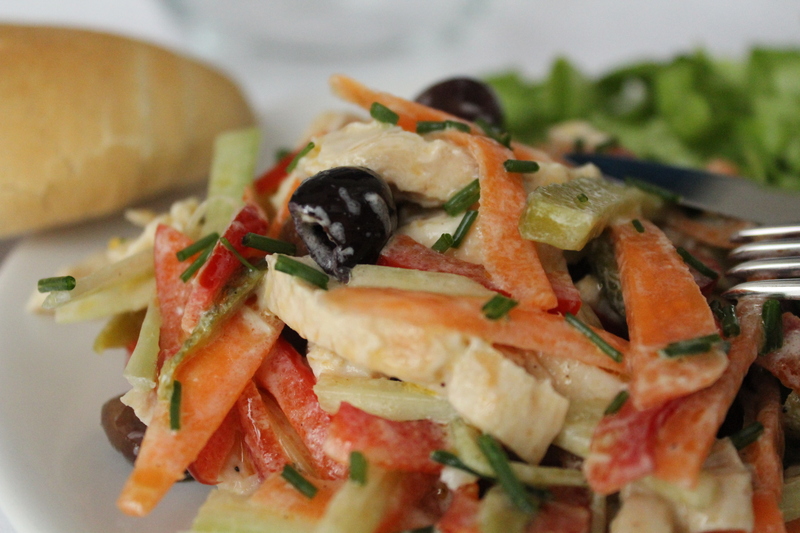 I personally love to add the delicate flavor of Taggiasche olives to my Pollo alla cacciatora; with their fruity-sweet bouquet and delicate mellow taste, they blend very well with the vegetables and the wine. These small dark-green olives are typically from Liguria (Western Riviera) and were originally planted and cultivated by the monks on their land overlooking the sea. Travelling in different countries I have realized that this delicious Italian dish is also well-known and appreciated abroad (no doubt why!!!) and is commonly called Chicken Cacciatore!!! 5. Add a little salt and/or pepper to taste if desired. Remove the rosemary sprig and serve immediately. 1. Wine. You can substitute white wine with red wine. Although I prefer to cook chicken in white wine, some people use red wine because it adds a stronger taste to the meat. 3. Peperoncino. Cook the chicken with love, passion and add some fresh or dried peperoncino to spice it up a bit! The saltimbocca (literally “jumps in the mouth” from the skillet, referring to the fact you have to eat it hot off the stove) is one of the flagships of the Roman-style cooking. This tasty dish is made of veal slices lined with prosciutto crudo (dry-cured ham) and sage leaves, cooked in butter and flavored with white wine. The origins of this recipe are uncertain. In any case, Pellegrino Artusi (a well-know Italian writer and gourmet in the 1800s) reported that he enjoyed saltimbocca in a historic trattoria (tavern) in Rome; after this event the dish started being served in several other taverns in the Capital and became popular throughout the Lazio region. Other sources, however, indicate that the origins are from Brescia (a Lombard city). Who really knows? The most important thing is that today, all over the country, we enjoy this fast-to-prepare and appetizing dish either as a second course or as main course. You can serve it with baked or mashed potatoes, or grilled vegetables. To save time ask the butcher to pound the veal meat for you. 6. Place the saltimbocca on a serving dish, keep warm. Cook the wine sauce for about 2 more min. Pour it over the meat and serve immediately. Saltimbocca is very tasty when eaten warm, right away! Italian savory pies have been around since ancient times, even Pre-Christian, and are linked to the farmers’ traditions. They are made with simple and fresh ingredients available during the growing season. If tomato is Italy’s summer vegetable, cabbage is definitely the winter vegetable. Kale pie is a true veggie lover’s delight. Tuscan kale, also called black leaf kale, dinosaur kale, Lacinato kale, or cavolo nero, appears in the markets in November and continues through spring. It is one of the oldest vegetables in the cabbage family. It is a leafy cabbage that resembles palm fronds with deep greenish black leaves and pronounced ribs. It has an intense cabbage-y flavor, but is generally sweeter than other varieties. 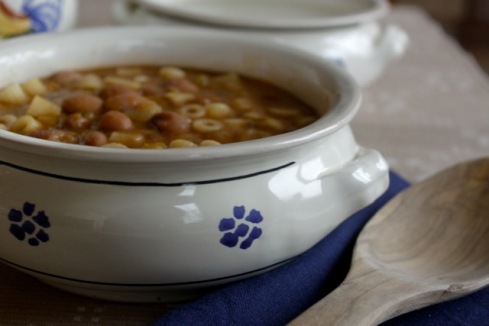 It is the basic of ingredient of many other tasty dishes such as soups (i.e Tuscan Ribollita), stews and omelets, and it is delicious on crostini di pane, too. You can enjoy it also raw in salads. Kale is highly nutritional vegetable, rich in vitamin A and vitamin C, folic acid (if consumed raw) and potassium. Kale pie can be served either as an antipasto (starter) or a main course. Wrap in plastic and refrigerate for at least 30 minutes. In a large ball mix the eggs with the ricotta cheese. Add the vegetable mix and season with freshly ground pepper. Set aside. Once the dough has rested, flatten it out on a lightly floured board, then transfer to a on a 24 cm (10 in) ceramic or glass pie or tart baking dish. Gently pat the pastry dough in the pan to 4 mm (less than ¼ in) thickness, to line the bottom and sides. The edge should have a slightly thicker layer of pastry than the bottom, about 5 mm. Prick the pastry bottom with the tines of a fork (four or five times is sufficient), then spread with the vegetable mix and bake until golden, about 40-45 minutes. It is delicious when eaten freshly baked and a little bit warm. The name brasato derives from brace (BRA-chay), the hot coals over which the meat was traditionally cooked. Braised beef marinated in a fine Barolo wine is one of the most representative and classic dishes of the Piedmont region, a savory delight for a cozy dinner on cold nights. The Barolo’s intense flavor gives an extra aroma and unique taste to the meat. Barolo is a rich, deeply concentrated full-bodied wine, with pronounced tannins and acidity (and therefore ideal for marinating). The tannins contained in the wine bind to the food proteins and, when used as a marinade, come across as softer. In addition to the wine flavor, the aroma of herbs such as bay leaf and rosemary gives a special touch to this dish. Rosemary and bay leaf are also known for their invigorating properties. For example, rosemary, the delicious herb associated with Aphrodite the goddess of love, boosts blood supply and helps increase sensitivity of the skin. You can enjoy brasato with either mashed potatoes or, like we Italians do, with polenta – “the Italian grits”. Polenta is made from cornmeal and ranges in color from golden yellow to the white polenta from Veneto. In the Roman times, a polenta made of crushed-grains (pulmentum) was the staple of Roman Legions. Maize, however, was not cultivated in Europe before Cristoforo Colombo brought it back in the 16th century. Then for hundreds of years polenta, the traditional food of the Northern Italian peasants, was known as the poor-man’s food. Now, defying its humble origin, polenta has also been discovered by a new, sophisticated audience and is frequently found in gourmet restaurants. You should start the day before you plan to cook the meat. Slice the meat when it is no longer too hot; it will be easier to slice. Pour the sauce on the meat and serve either with polenta or mashed potatoes. Pour the polenta onto a wooden cutting board, let it stand for a few minutes and cut it into slices using either a knife or, according to the peasant tradition, a cotton string.